Printable budget worksheet for kids helps kids in Grades 1 through 6 think through how to manage their money. Fun and clean design is aesthetically pleasing. This is a good way to have your students practice money skills and decimals. They will have to read the menu and answer questions about how much certain meals would cost and if the people have enough money. This can be done in the classroom with any menu from any restaurant. We actually did this as an activity before our team took our students out to lunch with a $15 budget per student. Great activity for teaching life skills and math! Below I have created a file regarding budgets. I have created this blank sheet for educational or personal use. 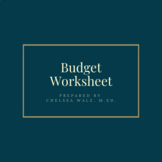 Perfect for teaching students how to plan a budget, as well as, adults using this for a budget binder. Many great uses out of this file. Great for keeping track of income and expenses. Here is a worksheet I created for my Careers and Personal Finance class. 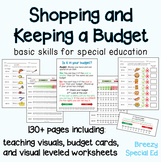 It includes websites to help students get the information, examples, and the budget sheet itself. 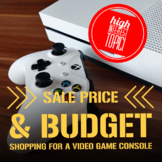 Students create their own post college budget. They will first guess what a variety of monthly bills cost and then you can give them an idea of what reality is for your geographical area. Simple one month budgeting worksheet. 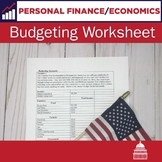 Let students discover what it might be like to budget expenses verses income in the "real world." 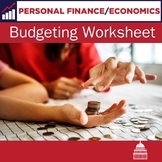 This activity will help students understand what kind of expenses they will be expected to pay once they get out on their own.